Shri. 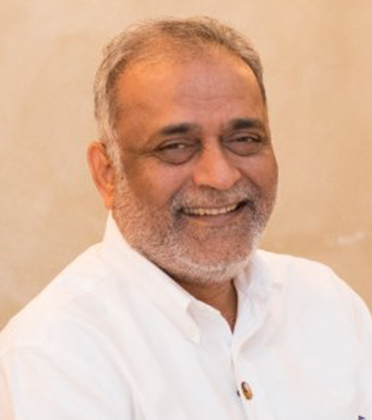 Kamlesh D. Patel was born on the 28th of September 1956 in Gujarat in India. He is the third, and current President of Shri Ram Chandra Mission. His life is a good example of the balance between spiritual and material existence. In 1976, while a pharmacy student, he came across Sahaj Marg and started meditation under the guidance of Shri Ram Chandraji of Shahjahanpur (Babuji). In the early 80’s, he travelled to New York in the USA to work in a pharmacy, ultimately ending up owning a chain of pharmacies in the New York and New Jersey areas. Shri. Rajagopalachari on his tours in India and all over the world. This gave him a valuable insight into the working of the Mission worldwide. He was nominated as Chariji’s successor in October 2011, and became President of Shri Ram Chandra Mission in December 2014, after the Mahasamadhi of his Master. He is married with two sons, and encourages his followers to embrace family life as the best place to develop the heart-based qualities of love, compassion, acceptance, patience and tolerance. He also advocates what he calls the “Wisdom Bridge”, which is the opportunity for young people to spend time with grandparents and other elderly people, so that the wisdom of a culture is passed down the generations. He is particularly interested in encouraging the younger generation.